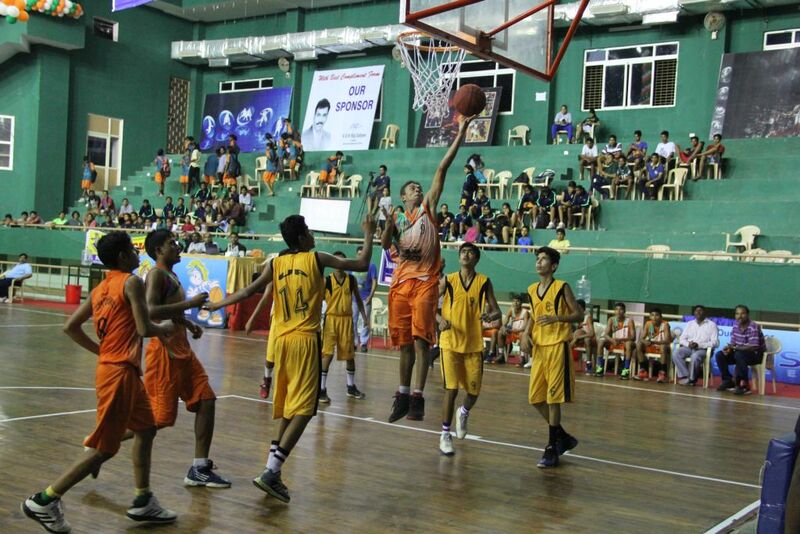 Chhattisgarh player (in orange) drives in for the layup against Uttar Pradesh (in yellow). Puducherry, 7th February 2016: After the classification games today morning at the Arise Steel 42nd Sub-Junior National Basketball Championship, the first semi-final began post lunch at the Rajiv Gandhi Indoor Stadium between the Chhattisgarh and Maharashtra girls. The first half belonged to Chhattisgarh as they built a lead going into halftime. But the Maharashtra girls came out firing on all cylinders in the second half, displaying a dominant third quarter led by their offensive star Shruti Bhosale (16 points), who drove to the basket with success. After losing the lead momentarily, Chhattisgarh fought their way back outscoring Maharashtra by 11 points in the fourth quarter. Elijabet Ekka put up yet another MVP-worthy performance with 30 points, leading her team to the 66-61 victory. Chhattisgarh girls have sealed a spot in the final of the sub-junior nationals for the third year in a row. The first boys’ semi-final was between defending champions Madhya Pradesh and a strong Rajasthan side. Madhya Pradesh have been unbeaten in the tournament so far and continued their fine form into the semi-final. After establishing a 10-point lead in the first quarter, Madhya Pradesh maintained a sufficient distance from the Rajasthan side. Led by Pankaj Singh’s 25 points, the defending champions thwarted all of Rajasthan’s comeback attempts with timely buckets to preserve their lead. The MP boys created multiple second chance opportunities by outrebounding the Rajasthan side 42 to 32 and scoring 16 second-chance points. MP’s Jeet Karwar put up a double-double with 12 points and 13 rebounds, including 7 offensive boards. MP registered a 59-46 win to make it to the final for the second straight year. Rajasthan’s Rajveer put up 18 points in a losing effort. The Madhya Pradesh girls faced the Tamil Nadu girls team in the second girls’ semi-final. This game, like the first girls’ semi-final, turned out to be a close contest. Tamil Nadu began the game well, playing to their typical style of ball movement and creating open shots. After gaining a lead in the first quarter, Madhya Pradesh fought back in the second, with their go-to scorer Rajvi Desai (27 points) catching fire. The game was tight till the end of the third quarter with Tamil Nadu clutching to a mere 3-point lead. But the Tamil Nadu unit pulled away in the fourth quarter, outscoring their opponent 24 to 14. Pavitra Sree had a big double-double for Tamil Nadu with 20 points and 18 rebounds. Deepa Darshini also contributed for Tamil Nadu with 18 points. Tamil Nadu ended up with a 70-57 victory and have a booked a place in the final where they will face last year’s runners-up Chhattisgarh. The Chhattisgarh boys, who were runners-up last year, squared off against Uttar Pradesh in the final semi-final today evening. Both teams started the game well in a low scoring first half. but it was a tale of two halves, as Chhattisgarh looked like a different unit in the second half compared to the fatigued Uttar Pradesh team. Chhattisgarh forced 28 turnovers from the Uttar Pradesh players and converted 22 points off their opponent’s turnovers. Chhattisgarh also had multiple offensive weapons with 4 players scoring in double digits. However, Uttar Pradesh relied on their lone scorer Priyanshu, whose 29 points went in vain. Just like their girls team, the Chhattisgarh boys made it to the final for the third straight year with a 70-49 win. It will be a repeat of last year’s boys’ final tomorrow with Chhattisgarh facing defending champs Madhya Pradesh. The loser knockout finals also took place today morning with Punjab winning in the girls’ category beating Chandigarh and West Bengal winning the boys’ category defeating Punjab. The 42nd Sub-Junior National Basketball Championship is being organised in Puducherry from the 2nd to the 8th of February 2016 at the Indira Gandhi Sports Complex. There are two indoor courts inside the complex, named Rajiv Gandhi Indoor Stadium, along with one outdoor court in the complex dedicated to the tournament. This year’s event is being organised by the Puducherry Basketball Association under the aegis of the Basketball Federation of India. The Sub-Junior Nationals is an annual national tournament for U-14 boys’ and girls’ teams from states across India. This year’s tournament is witnessing the participation of 23 boys’ teams and 21 girls’ teams. Arise Steel is the main sponsor for the tournament. The 41st Sub-Junior Nationals were conducted in Nashik, Maharashtra, where the Kerala girls and the Madhya Pradesh boys emerged victorious clinching the gold medals. Chhattisgarh girls and boys were the second placed teams. The 2013 version tournament was conducted in Patna, Bihar. The Chhattisgarh teams won both the boys and the girls category last year, while the Madhya Pradesh boys and the Tamil Nadu girls finished runners-up respectively.